You wanted a machine so easy to use, it didn’t take the highest paid person in your shop to run it. You wanted the same high resolution but without the calibrations – repeatable accuracy at a speed that couldn’t be beat. In short, you wanted a machine that offered value on a production scale, with the same customer service and lifetime tech support you’ve come to expect from B9Creations. We listened, and we delivered a machine designed with you in mind. The B9 Core Series sets a new standard for 3D printing everywhere. In a competitive business environment, time is money. The B9 Core Series can save you both. The B9Creator was already 2x faster than the industry average. The new B9 Core Series ups that advantage with speeds 4x the industry average. That’s print speeds reaching 120+mm/hr. A ring can print in as little as 45 minutes, which means more business and faster sales. Such short print times enable same-day design, print, and cast. With an industrial HD LED light engine at its heart, a new patent-pending DuraVat that lasts 600 prints or a year, and no time-consuming calibration, the B9 Core Series prints faster than anything on the market and allows for quick-turnaround of prints and end-use products. The B9 Core Series streamlines the 3D printing process – less prep, more prints. We found B9Creator users frustrated with manually recoating their vats as they became cloudy frequently. With our new patent-pending B9 DuraVat, there’s no recoating involved, and it is guaranteed to last for 600 prints or one year before clouding, saving you hours of prep work between prints with no need to ever buy PDMS again. With no calibration necessary, the B9 Core Series operates with the push of a few buttons – on a touchscreen interface that connects to your computer via Wi-Fi, Ethernet, or USB. The machine also stores previous prints, allowing for easy and repeatable printing. Plus every machine comes with a free remote factory start-up training, walking new users through the basic commands and components of the machine and software. 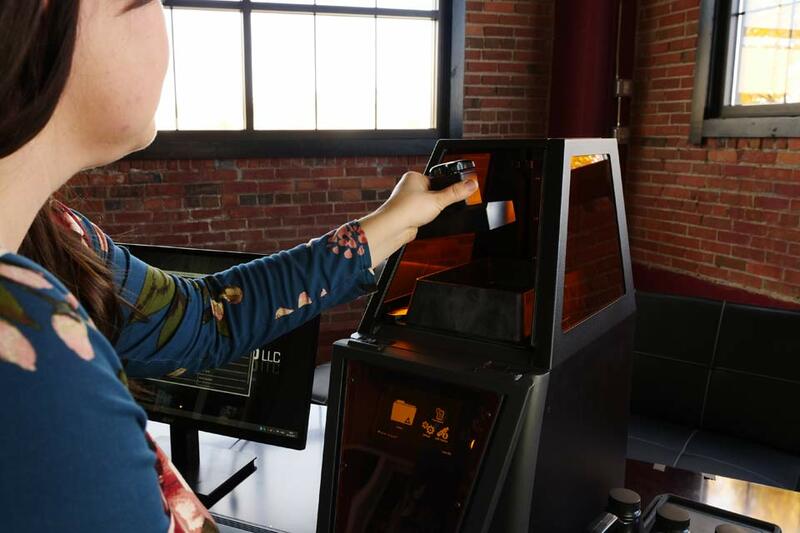 The B9 Core Series is so user-friendly, even someone who has never touched a 3D printer before can use it. In fact, at trade shows and events, we always ask people who’ve never seen our machine before to see if they can do a print – and we haven’t had a single person fail! The B9 Core Series proves its value day in and day out by simplifying to-do lists, shortening customer wait times, and increasing productivity. With guidance and help from experienced industry specialists, we focused on features that emphasized a machine capable of keeping up with the demands of the business world – speed, simplicity, precision, and repeatability. The B9 Core Series isn’t just a pretty machine, it’s a sales tool. Paired with our casting resins, which provide the ultimate results for castable jewelry, and prototyping resins, which provide extraordinary repeatable results in a fraction of the time, the proof is in the prints. Ready to upgrade but want to make sure the B9 Core Series is right for you? Check out our competitor comparison and financing options, request a sample, or contact us for a free business consultation on how the Core Series can grow your business and integrate into your workflow.